The First time you lie? You better have another 100 lies to cover up that one lie, until you talk the Truth! I wrote this using my own words using my own thought and Search Quotes decided to put the writer as unknown, so UNFAIR! True words come out without arrangement. Slavery is hell. Freedom is heaven. Deception is warfare. Honesty is peace. Admit when you don't know the answer. Don't try to fake your level of knowledge or skill by making up an answer when you don't know one. Admit if you don't know something. Lying is always a mistake. if you've done something wrong just tell the truth so you won't commit two mistakes. Honesty takes various forms like truthfulness, sincerity, moral uprightness and it is our duty to impart the knowledge on honesty in the young minds of children. “It is the beginning of education” says John Ruskin. Always tell the truth, if you can’t tell the truth, do not lie. 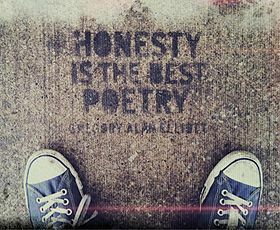 The great truth is honesty which is the best policy. An honest person will always have a clear mind and a mind that is afraid of no one. He can hold his head high and walk with dignity in all situations. Dignity, power, courage, glory, respect and leadership will all follow the person who follows honesty. It may be a little harder to practice honesty at all times but it will eventually pay at the end. There should be no compromise on honesty and as an American proverb puts it “honesty is like an icicle; if once it melts, that is the end of it “.